Inspired by the scents and colours of Africa, L'occitane have brought out 3 limited edition hand creams and for the last few weeks, I've been putting the hibiscus flower one to the test. The hand cream is thick, but non greasy and absorbs quickly into the skin to leave my hands feeling soft and moisturised. The hand cream contains extracts of hibiscus, sunflower seed, rosemary, rapeseed and coconut. Scentwise, it's creamy, but at the same time floral and sweet. I always thought L'occitane hand creams came in metal tubes (which I don't like) but the actual packaging feels almost plastic and is more flexible than it looks, so I'm hopeful that I'll be able to finish the hand cream without it cracking and leaking out. Overall, a rich but easily absorbed hand cream, and one that I would recommend if you suffer from dry skin or need to repeatedly wash your hands throughout the day. Have you tried any of the L'occitane hand creams? What's your favourite heavy duty hand cream? The rose L'Occitane hand cream is divine, I have it on my desk at work and have nearly got through a full tube already because I want to use it so much! I have the Hibiscus lip balm and it's gorgeous too. 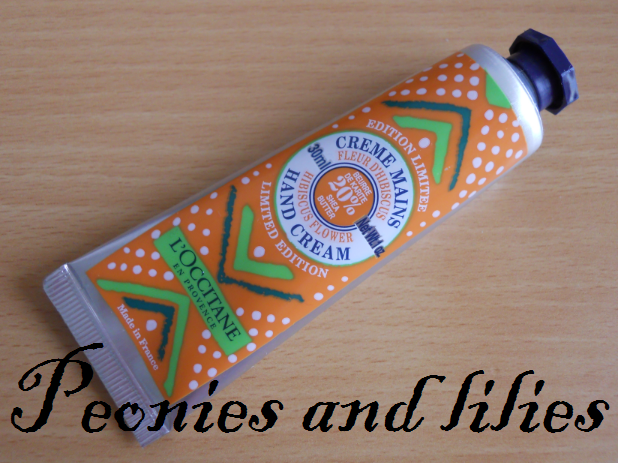 I love L'Occitaine hand creams, they are pretty fantastic! Stila make up amnesty- free lipgloss!